* Find the yarnover/decrease pairs in the pattern and lightly circle them if that helps you keep track of them. * Always work the pairs together. * If you do not have enough stitches to work the paired decrease/yarnover combination, then work them in stockinette instead. Row 1: *K1, yo, k2, ssk, k2tog, k2, yo; rep from * to end. K1, yo, k2, ssk —— and then —— k2tog, k2, yo. To work the first half properly, you need five stitches; to work the second half properly, you need four stitches. So besides noting where the "pairs" are, you also need to note where they are in relationship to each other. 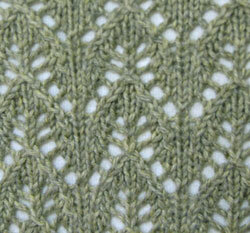 It helps to break the pattern up into sections, with one yarnover/decrease pair per section. Now we're ready to start increasing. For simplicity, we're only going to talk about increasing (using a simple M1) at the beginning of Row 1. First inc row: M1, *k1, yo, k2, ssk, k2tog, k2, yo; rep from * to end. Second inc row: M1, k1, *k1, yo, k2, ssk, k2tog, k2, yo; rep from * to end. Third inc row: M1, k2, *k1, yo, k2, ssk, k2tog, k2, yo; rep from * to end. Fourth inc row: M1, k3, *k1, yo, k2, ssk, k2tog, k2, yo; rep from * to end. Fifth inc row: M1, k2tog, k2, yo, *K1, yo, k2, ssk, k2tog, k2, yo; rep from * to end. Sixth inc row: M1, k1, k2tog, k2, yo, *K1, yo, k2, ssk, k2tog, k2, yo; rep from * to end. Seventh inc row: M1, k2, k2tog, k2, yo, *K1, yo, k2, ssk, k2tog, k2, yo; rep from * to end. Eighth inc row: M1, k3, k2tog, k2, yo, *K1, yo, k2, ssk, k2tog, k2, yo; rep from * to end. Ninth inc row: M1, k4, k2tog, k2, yo, *K1, yo, k2, ssk, k2tog, k2, yo; rep from * to end. Tenth inc row: M1, k1, yo, k2, ssk, k2tog, k2, yo; *K1, yo, k2, ssk, k2tog, k2, yo; rep from * to end. You've now added an extra repeat to the beginning of each row. You can use this same logic to work out increases at the end of a row, just as you can use the logic presented on Monday to work out decreases at the end of a row. It does get a little hairy to try and do this on the fly, however, so I highly recommend either charting things out, or writing out the shaping rows before you plunge into the knitting, just to save your sanity. (1) When you don't have enough stitches near the edge to work both the paired decrease/yarnover for the lace pattern AND the decrease you need to work for the shaping. If you have enough stitches to do both, do both. 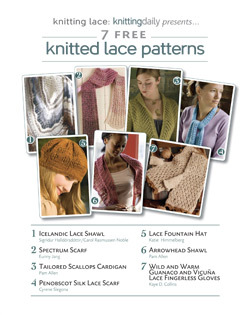 If you don't, then bye-bye lace pattern, hello plain stockinette. (2) When you have enough extra stockinette stitches to work a part of the lace pattern properly. 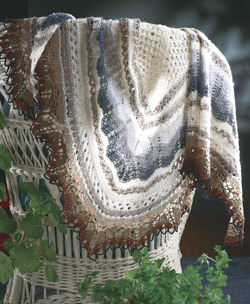 You might be able to work only half of the pattern, but that's enough to keep the lace pattern contiguous. Who Invented Lace In The First Place?